There are so many nagging questions going on inside the minds of CPA firm owners (partners). Where are we taking this firm? If we did this or that, would our people be upset? Are our competitors actively trying to steal our people? Are our competitors stepping-up their efforts to steal our clients? Why can’t we be more united on our vision? Other firms seem to be way ahead of us with social media. How can we catch-up? Is this the year we will explore being acquired? Is this the year we will finally go through with acquiring that smaller firm across town? Denise, our long-time, all-star manager keeps threatening to leave. Is this the year she will do it? We keep complaining about how Ted is our wild-card partner and never gets on-board with our procedures and initiatives. Are we going to do anything more than complain and ignore him? Bill is our only real rainmaker. He’s 63. What are we going to do? Who are we really? Are we the prominent, progressive firm we describe to applicants and potential clients? Notice, at the beginning, I said “nagging questions going on inside the minds….”. The major challenge inside many firms is getting these questions out of the partners’ minds and verbalizing them. Partners tend to THINK about many questions and WONDER about outcomes but they hesitate to actually SPEAK-UP. If you are a partner in a CPA firm, it is your responsibility to ASK QUESTIONS, to say what’s on your mind, to be completely open and honest with your partners and be willing to listen to their honesty in return. In the current issue of Accounting Today, Dan Hood takes a light-hearted look at “Which Firm Are You?” as compared to a TV show. Are you The Walking Dead, Downton Abbey, The Big Bang Theory and so on? This might be a good exercise at your next partner retreat. Better yet, ask you team to compare your firm to a TV show (and be prepared for honesty). When there's an elephant in the room introduce him. Sally has become a key person on your team. She had just been promoted to Supervisor and was not only building some strong client relationships, the younger team members were requesting to be assigned to her jobs. Yes, she got a great offer from another firm, an offer that was almost too good to be true. And, yes, you have been stalling on promoting her to manager because you already have 12 managers and are not sure what the future truly holds for her at the firm. You have delayed talking to her about all this and even though she has been asking questions about her career path. How do you replace her? You are thinking about the recruiter fees you will be paying to get someone with her experience. WAIT…. don’t you have an internal mobility plan? If not, you should begin one now. Before you go outside to hire, consider asking your Seniors to stretch a little and fill the role of Supervisor. Ask your associates to stretch a little and fill the role of Senior. You get the idea. Your best performers (at whatever level) are looking for career advancement and career development. They will step-up and go above and beyond if you present the opportunity. They are waiting for you to ask and they don’t want you to bring a stranger in from the outside. Besides, your own internal candidates already know your culture, procedures and quirks. Give them a chance. You might be surprised at how eager they are to stretch…. if you give them the opportunity. The traditional way a CPA firm finds and uses a management consultant is to ask around and find out who other firms are using or identify someone they have heard speak at a management conference then hire them to facilitate the partner retreat. Initially, they will facilitate your retreat or conduct a planning day or two with your partners or management leaders. Then they attend your monthly partner meetings or executive committee meetings (60 to 90 minutes per month via Skype or other virtual resource) to continually contribute and to hold you accountable. The firm budgets an amount for the 2-day planning session and another amount for the 12-month on-going involvement. Result: You have a much better shot at actually getting things done, at moving your firm ahead, at recruiting and retaining top talent and developing a culture within your firm of continual change and improvement. That’s the culture the new workforce wants to experience. Soon Busy Season will be over, one more week. It will be followed by Coma Season, the 2 or 3 weeks following Busy Season when CPAs and their team members go into a walking/talking coma. Their eyes seem glazed and they have a distant stare indicating that they are exhausted from Busy Season. For some serious cases, Coma Season can last a full month or more. Next comes Retreat Season, the time when CPA firm owners gather at an off-site, lovely facility or location to plan what they need to do to become a more successful, profitable, well-known, talent magnet and client magnet firm. Then comes the longest season of all, Procrastination Season, where anything and everything can get in the way of carrying-out the plans that everyone agreed upon and committed to during Retreat Season. In a recent post by Andrew Argue on The Bean Counter site, he explained that he has been listening to an audiobook titled, The Ultimate Sales Machine. The author notes that the #1 factor in successful selling is “pig headed discipline”. Check out his blog post and look at the picture depicting the path to achieving your plan and the reality of achieving your plan. At your management retreat this year, identify ONE OR TWO initiatives (don’t try to fool yourselves into believing you will accomplish half-a-dozen things or more). Then agree to and commit to….. even pinky swear to the fact that this year you will use pig headed discipline to carry out the action steps needed to implement your initiatives. It will not do to leave a live dragon out of your plans if you live near one. When I read a recent article (Fast Company) about the current beliefs of Millennials the phrase, “strange bedfellows” came to mind. Although these days…. strange bedfellows probably means something completely different than my thought process. According to the dictionary it means unlikely companions or allies. Some interesting thoughts were divulged according to Deloitte’s 2013 Global Millennial Survey. They sought comments about how business can innovate and impact society from those born after January 1982. 65% of respondents, who were located in 16 markets around the world, believe that their company conducts activities that benefit society. Is this just wishful thinking? Millennials around the world don’t agree on exactly what societal changes are most pressing. Brazilians believe resource scarcity will be the biggest issue. In the U.S. and India they are most concerned about inflation. South African and many Western European millennials are worried about unemployment. The majority of millennials believe they’re innovative people and they want to work for innovative companies. This is where the strange bedfellows thought entered my mind. Businesses (including CPA firms) that want to attract millennials need to emphasize their innovative ways (and positive societal impact). I find that inside many CPA firms, leaders simply want to know what other firms are doing and then follow the herd. CPA partners have told me that they discuss the same things year after year at their partner retreat. Some firms have the same retreat facilitator for 10 or 15 years. Of course, many progressive, forward-thinking firms actually are embracing change and leading the pack. I believe the simple reason is that they are able to implement. As we always said at my former firm… we want to be on the leading edge, not the bleeding edge. How about your firm? Are your millennials innovative? Do you even ask for their input? Please don’t squelch their innovative ideas! Your CPA Firm – Is It Focused Or Scattered? I was recently reading about the advice Steve Jobs gave Larry Page, co-founder of Google, when he took on the role of CEO of Google in 2011. It comes from the book by Walter Isaacson. What are you doing to keep your firm from getting flabby? Are you larded down with B players? Has your firm grown up? If so, has it turned out like you always wished it would? Are you a fairly new firm? What do you envision for your firm? Is your firm too scattered in it’s focus, trying to be all things to all people? Are you building a team of lieutenants you can count on (succession planning)? Are you adequate but not great? Maybe you should use these questions as the agenda for your next partner retreat. My job is to make the whole executive team good enough to be successors, so that's what I try to do. There has been a lot written about how to plan, prepare and organize your annual partner/leadership retreat. My purpose today is not to rehash all of those details. Have a retreat every year, facilitator or not (better with a facilitator in almost all cases). Try having one traditional retreat in May or June and then have another one-day retreat later in the year (mid-November) to be sure you are on track and still engaged in the action plan. Involve non-equity partners, principals and even key managers to the first day of your retreat. On the 2nd day, include partners and principals in the morning and then end the retreat with just the equity owners in the afternoon. That way the decision-makers can reflect on the day and a half and dig deeper if they need to. Mixing things up and doing things differently from year to year keeps things fresh. People will usually speak-up if they are asked. At first, they might not divulge everything that is on their mind. However, it is important to get the conversation started. Asking once isn’t enough. Inside your CPA firm strive for a culture where asking and replying honestly is the rule of thumb, something that happens naturally. Try this experiment. At this year’s partner retreat, your group will probably come up with a new initiative or project that you have learned at a firm association meeting or conference. The leadership group will probably discuss it, debate it and eventually agree upon a strategy. BEFORE you officially roll it out ask your team how this proposed decision by the partner group will affect them. As you are planning your retreat, before the meeting date ask EVERYONE in the firm to submit what they think is the biggest issue that needs to be addressed by firm leadership in 2013. Just one question and encourage them to give you just one answer. If you think you will get more truthful answers, let them do it anonymously . If you want help, contact me and I’ll help you facilitate the survey. If you identify that one big issue or new idea, ask EVERYONE in the firm to help solve the problem, initiate the new idea, or help carry through the implementation. Give your valuable CPA firm team members some control over their own work lives. I was paging through a magazine last week when I saw an ad for Windex Touch-Up Cleaner. As with most things in life, it made me think of CPAs (yes, I’m weird that way). Windex has been around for as long as I can remember. It’s one of those brands that people call glass cleaners even if they are another brand. It’s rather like saying, “Make a Xerox copy.” when you aren’t using a Xerox brand machine. “Hand me the Windex” – means almost any glass cleaner. So, the ad made me realize how creative the people must be at SC Johnson, the makers of Windex. If they can take a widely-accepted, well-known product and keep re-packaging it so that people will buy more, why can’t CPAs do the same? Watch a 30-second commercial here. Now, consider your agenda for your annual firm day or partner retreat. How could you use your combined creative powers to re-package your firm, your services, or your culture to make your clients keep buying and to make your people keep buying-in to your firm vision? Gary Boomer is known for modifying the meaning somewhat and calling the annual gathering of CPA firm partners/managers a “summit.” He notes that a “firm retreat” implies that you are looking to the past and moving backwards. I like to call them simply “planning sessions.” Some are focused on strategic planning and some have a more “immediate needs” focus. Traditionally, only firm owners attended the annual meeting of partners. Then, many years ago, owners realized the importance of adding the firm administrator to the list of attendees. At first, the firm administrator just took notes but they soon evolved to being a full-fledged participant because of their unique view of the actual operations of the firm and their insiders view of the staff. As firms have hired marketing professionals, they are often invited to at least a portion of the annual meeting of partners, as are key managers. My advice? Make them more inclusive rather than exclusive. Progressive, well-managed firms identify the date and the facilitator for their annual planning session five or six-months in advance. That means you should book yours in January 2013 for the summer of 2013. Boomer in his recent article in Accounting Today, challenges firm owners to break out of the CPA mold for these annual meetings. He advises that you make them more creative and fun. I couldn’t agree more! Have you had the same facilitator for the last 3 years? 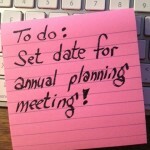 Time to change – inject some new and different thoughts into your meeting. Seek someone who has actually worked inside a growing successful firm in recent years (yes, that’s a plug for me). Here are Gary Boomer’s bullet-points for a successful Summit. Follow the link, above, to read about each one. Select a relaxing venue away from the office. Encourage everyone to participate during parts of the firm summit. Utilize a professional facilitator as your leader. Start your firm summit with a positive focus exercise. Work from an agenda and stay on time. Avoid the numbers, stick to the concepts. Keep minutes of the firm summit and share them with the entire firm. Think strategically, rather than tactically. Take breaks of 10-15 minutes every hour. Mix the sessions in with activities such as golf, tennis or boating. Invite outsiders, such as experts or even clients. Name task forces for follow-up with a responsible person and due date. Create a one-page laminated game plan. Develop 90-day game plans and accountability reviews.